Our handcrafted traditional oak framed buildings can be supplied in various forms from the Oak frame to the complete package including: Oak frame, rafters, boarding, roof covering, doors, windows. Acorn can supply your building in a kit form which you can erect yourself or we can manage the whole project, providing a complete and comprehensive service from foundations to completion. 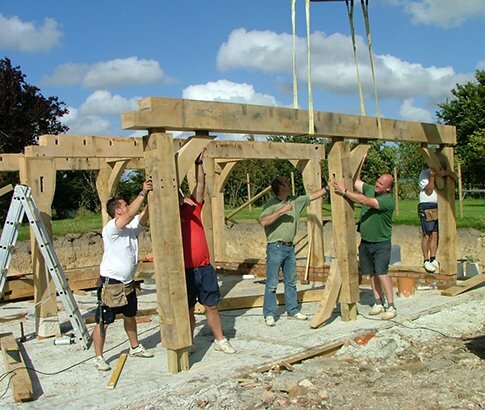 Planning permission, foundations and carpentry methods are all important factors in the construction of an Oak framed timber building. 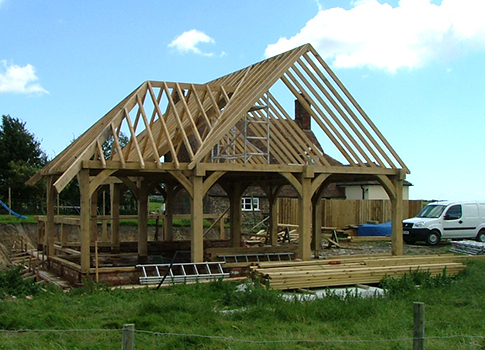 The location and ground conditions of where your Oak framed building will go will be subject to planning permission and a structural survey to determine the best method for building the foundations. If you choose to take the project on yourself then we can advise you with this, or we can provide this service as part of our comprehensive building package. Machinery is used in the preparation of the foundations and for the transportation of materials, but the buildings techniques we employ are traditional carpentry methods, most of which are done by hand.